What you should know before running a meeting with Meetingify. To get started, sign-up for free directly on the meetingfy.com site, or receive your invitation via e-mail through the sign-up button or link [Click here to Sign Up]. Signing up is straight forward due to the flat role model. This means that there are no administrators, there are no role based restrictions, and this app is ideal for use by both small organized teams and larger structured teams. The signup process does not require any set-up. Once on the app, a user is only able to gain access to the meetings that they are to participate in, and in addition, can only access the to-do tasks that have been directly assigned to them. As a user in a meeting, one is able to play multiple roles. These include being a meeting participant, meeting organiser, agenda setter, appointment planner, note taker, to-do editor and file uploader. 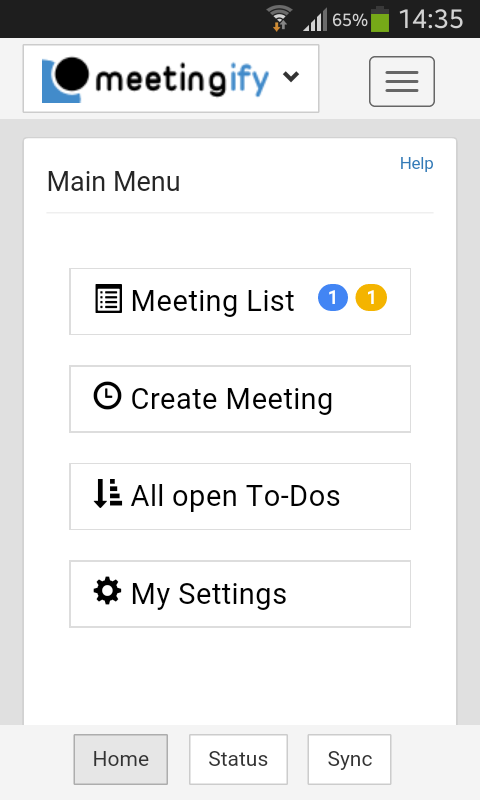 Once you have inputted the required information for your meeting, by pressing Save Draft you will be able to save all the information that you have prepared for your meetings as a draft. Only when you have reviewed all this information and it has met your requirements can you then choose to send out invitations or notifications. To send out the invitations, you need to publish your meeting by pressing the Publish button. As you do so, all the participants, presenters and moderators will automatically receive a first time invitation. In case of any further changes to the meeting, a notification will also be sent to those required as the meeting has been published. An excellent advantage of this app is that it runs well on HTML5-based web browsers on smartphones, tablets and desktops.